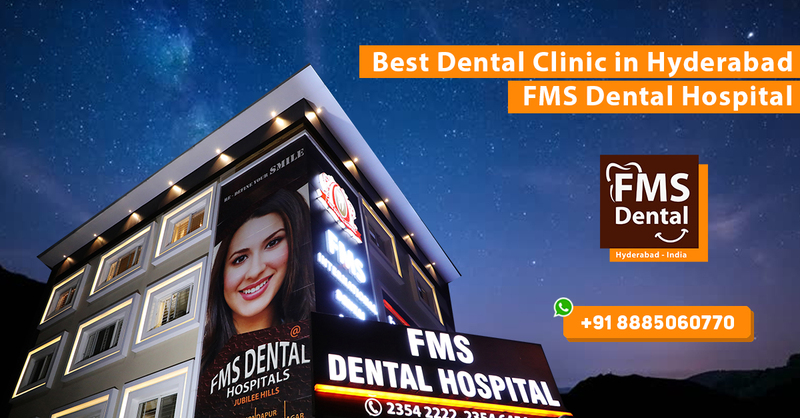 FMS DENTAL HOSPITAL, Best Dental Clinic Kukatpally Hyderabad India is the best Dental Clinic in India. This Dental Clinic has best dental surgeons & senior Implant dentists in Asia. FMS DENTAL HOSPITAL, Best Dental Clinic Kukatpally Hyderabad India has 12 operatories with digital OPG, Dental LASERS & OSHA standards of sterilization. Services like Root Canal treatments, CAD-CAM designed Zirconium Crown & Bridge, single tooth & full mouth replacements with Dental Implants in 3 days are performed. Single sitting RCTs & microscopicEndodotics has been the forte. LASER gum therapies and LANAP is done by senior Periodontists. Smile designing with ceramic laminates, composite veneers & Teeth whitening is done by senior cosmetic dentists. A dynamic team of 10 dental specialists and 3 general dentists and dental hygienists are available between 9a.m. to 9 p.m. round the week. Micro-endodontic (Root Canal Treatment) and evidence based dentistry is been the forte of this clinic. Good information you had shared.Thank You!